Stuart Gordon has an extensive resume that features five H.P. Lovecraft adaptations, a Hollywood blockbuster and a number of features that have gone criminally ignored by the mainstream. Following his big break in 1985 with the cult classic RE-ANIMATOR, Gordon went on to helm FROM BEYOND, DOLLS, CASTLE FREAK and DAGON, just to name a few. These are films that deserve their place on the mantle of just all-around awesome horror flicks. He also has writing credits in HONEY, I SHRUNK THE KIDS and HONEY, I BLEW UP THE KID. Add to that his impressive three-episode run between the television series MASTERS OF HORROR (two episodes) and FEAR ITSELF (one episode), and it’s no secret within the genre filmmaking community that Gordon is one of a few remaining of a rare breed—a creative mind that can easily mix original ideas with classic literature, a man who engrosses you with the story and then has the ability to gross you out in the very next scene. It’s a rare trait and one that I was eager to discuss with Mr. Gordon. 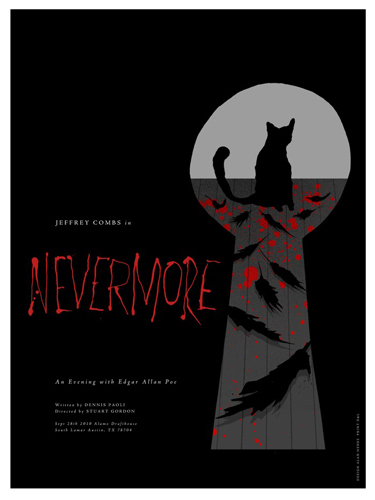 As of late, Gordon has been busy putting the finishing touches on what he hopes to be his next film project, a silver screen adaptation of his widely acclaimed theatre play Nevermore—An Evening With Poe that will have iconic horror actor Jeffrey Combs reprising his role as Edgar Allan Poe and has taken to the crowdfunding site Kickstarter to make the project a reality. The Kickstarter campaign runs until midnight on Halloween night, with a goal of $375,000. To think that Gordon is confident enough to make a time piece film of one of the greatest writers of all time for such a paltry sum shows just how creative Mr. Gordon can be. Or just how crazy he is. My bet is on the former. 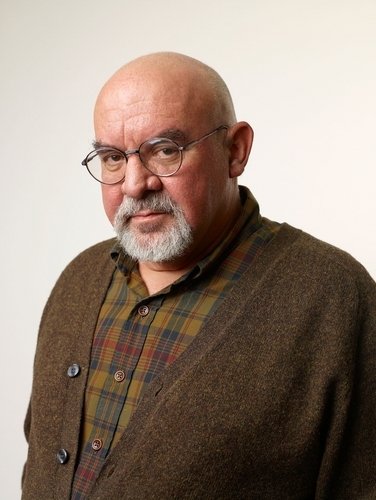 I recently had the chance to chat with Stuart Gordon, a fellow Chicagoan and all-around great chat, about everything from NEVERMORE to Ray Bradbury. Ravenous Monster: Why do you feel now is the time to spotlight Poe in a film? I certainly think it’s well past due that someone takes on his life without all of the caricature personality stretches we’ve seen from the media over the years. Stuart Gordon: What a poor guy. Just bad things happened to him, especially so young in life. He lost his mother and wife both to tuberculosis. The guy just couldn’t catch a break. Even at the end, with his death being such a mystery, it led to so many people coming up with their own conclusions, some of which ended up dragging his name through the mud. Poe is so incredibly popular still. I recently Googled “Poe in the news” and pages and pages of stuff came up. He’s still all over the news even to this day. He’s a guy who fascinates us and we can’t seem to get enough of him. RavMon: Why do you think his popularity is still so big? He’s certainly withstood the test of time just as good as any author ever has. Gordon: There’s a library in New York, Morgan Library, where a huge exhibit is of Poe. There are four museums dedicated to Poe—one in each city he lived in. He’s become the most popular American writer of all time, I think. They still teach his works in schools and he’s really the only writer kids really love learning about. Doing plays and reading his works. His work still stands up. I’ve done The Black Cat for MASTERS OF HORROR and I also did a movie on THE PIT AND THE PENDELUM. There are so many great stories of his. RavMon: With NEVERMORE, you really shine a light on the human side of Poe. Like I said earlier, all of the goofiness and longstanding belief that he was simply a nutcase, all of that is stripped out of your version of his life. 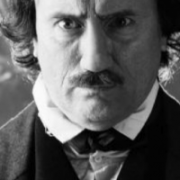 RavMon: I enjoyed the film THE RAVEN although that wasn’t even close to a biographical film of Poe. Gordon: That film could have done a lot more. Some of the things they did in it were a bit bizarre. RavMon: I never heard of him having a raccoon as a pet! Gordon: He had a black cat as a pet, that’s for sure, but never a raccoon. They tried to tie that in to the whole rabies theory of Poe’s death but it was just bizarre. RavMon: You’ve practically made a career out of mixing horror with a comedic relief. RE-ANIMATOR is the prime example of that. A lot of Poe’s work has a very dark, subtle comedy to it as well at times. Why do you feel as if horror and humor go hand in hand so well? Gordon: You’ll never find an audience that wants to laugh as much as a horror audience. It’s always a good idea to give them something to laugh at. You look at JAWS, there’s that great moment when Roy Scheider is throwing chum over the boat and the shark’s head comes out of the water. The audience jumps out of their seat, of course, and then there’s the classic line, “We’re gonna need a bigger boat,” and that huge laugh. Fear and comedy always work well together. RavMon: You’ve practically made a living adapting the work of H.P Lovecraft to the tune of five films. He doesn’t seem like necessarily the easiest writer to adapt into film. Gordon: Well, you know, for Lovecraft it’s hard because there are no female characters. You have to figure out, where’s the girl? There needs to be one. Gordon: Some stories would be impossible to do. Others are very cinematic.. It’s about taking the right story. His characters are, for the most part, quite solid and that’s important because the audience needs to care about them. 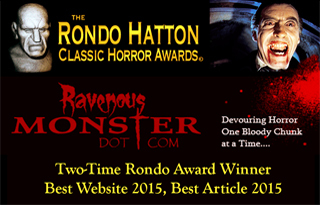 RavMon: Have you ever considered a biographic film on Lovecraft in the same vein of Poe with NEVERMORE? Gordon: Lovecraft is so different than Poe. He was a huge fan of Poe’s and there would be no Lovecraft if it weren’t for Poe. It would be a strange movie, for sure. He was such a strange character. There was actually a script floating around where it mixed Lovecraft’s true life with his stories. It never got made. I liked the script, though. RavMon: Using Kickstarter to try and make NEVERMORE is a very cool idea. What made you decide this was the way to go with this project? Gordon: It’s gotten very difficult to finance a movie, unless it’s a blockbuster with a big studio that is ready to spend hundreds of millions of dollars on it. Making a small movie has gotten to be very hard. Independent movies are an endangered species in theaters these days. The idea of social networking to fund a movie is fascinating. It takes the project out of the hands of the studio and into the hands of the people. Hollywood isn’t making the movies that people want to see anymore. We want something new and fresh, which is the exact thing they are most afraid of doing. They don’t want to take a risk. That’s why it is all about remakes and sequels these days. They want to play it safe. Kickstarter is something that is really fascinating and I wanted to try it. RavMon: You seem to really get in the groove of real horror. You’ve done STUCK (based on the true story of a woman who hit a homeless man and left him lodged in her windshield for days while she kept him hidden in her garage) and now you are working on a play called TASTE, about a man who puts out an ad in search of someone to cook and eat. This is another true life event. Gordon: Real life is crazier than anything you can make up. You couldn’t make up that stuff! It’s nuts. I open the paper and go ‘I can’t believe what I’m reading here’. TASTE will be opening in Los Angeles at The Sacred Fools in April of 2014. RavMon: Having been born in the Chicago area like myself, have you ever considered examining the vast world of real horror The Windy City has to offer? Gordon: It’s funny you mention that. John Stryski, who wrote STUCK with me, and I have started work on a script about H.H Holmes and the 1893 World’s Fair. We’re calling it SLAUGHTERHOUSE and that’s really what he built. It was a factory of death. We’ve been working on the script for a few years now. It’s a very complicated story. He was a mad man, and was executed before he could confess. You know, it’s funny—people guesstimate Holmes killed upwards of a hundred people. Jack The Ripper killed seven, maybe up to twenty-three people, yet Holmes is never heard about for some reason. He just didn’t get the press like The Ripper did. What part of Illinois are you from? RavMon: I was born and raised in Waukegan. Gordon: Ah, (Ray) Bradbury Country. Green Town. RavMon: Definitely! Were you a fan of his work? Gordon: Ray was actually a very good friend of mine. I did a film based on his story THE WONDERFUL ICE CREAM SUIT. We became very good friends. What a great man he was. Ray never flew. He had a fear of flying and when the film was playing in Chicago, he actually came out to see it and then we made a trip to Waukegan to visit. It was the first time he’d been back since he and his family moved to California, when Ray was twelve. He saw the film and then we saw his hometown. It was the return of the prodigal son. RavMon: Stuart, this has been an absolute pleasure. Thank you so much for your time. It meant the world to me. I wish you nothing but the best on the Kickstarter campaign and I look forward to hearing more about NEVERMORE in the very near future! Gordon: It was a pleasure. Thank you. I look forward to good news as well. I love this! I just donated to the project. The deadline is tomorrow! Awesome article. It’s always great when you can see that those people you hold up to be legends are in fact humble folks. Maybe it’s something in that Midwestern air. Back in 2009 I had the pleasure of sitting next to Stuart Gordon in a theater for a screening of Re-Animator, a surreal experience at first. But by the time the movie was over, things seemed quite normal as he proceeded to give a great Q&A. He’s possibly the most approachable filmmaker I’ve had the opportunity to talk with. He hung out most of that entire day and he didn’t have any handlers with him or any of that type of thing. Very cool.